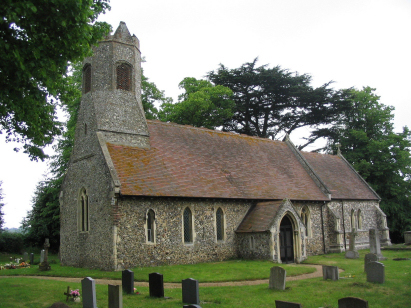 Norfolk possesses two parishes named Witton and to add to the confusion both have a church dedicated to St Margaret. This Witton (with the suffix "by Norwich") is located about 5 miles due east of the city of Norwich. 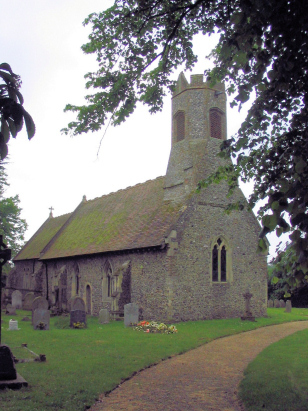 This Witton is sited just north of the A47 road which connects Norwich to Great Yarmouth in a network of small parishes between the Yare river and the Norfolk Broads. Formerly a very small village, little more than a hamlet, Witton has grown in recent times as a number of cottages have been bought up by commuters attracted to the rural life yet within a few minutes commute of the city. The busy A47 dual-carriageway runs through the south of the parish giving access to the regions main truck roads. Witton likes to keep its feet dry being 20 metres above the River Yare and largely consists of arable farmland on the sandy soils covering what was once an extension of Norwich's Mousehold Heath as a ridge of glacial deposits into the heart of Broadland. St Margaret's church is located at the eastern end of the main lane which runs through Witton village. The church is tucked away down a small lane. The church, unfortunately, has been much modified over the centuries, indeed Pevsner describes it as being unable to accurately date. Much was completely rebuilt in the mid-Victorian period and what can be dated (the tower base) is rather late-Perpendicular i.e. 15th century. Documentary evidence suggests that much work was done in the early 16th century but again that has since been replaced by Victorian restorations. A single standard 800-entry register book covers the whole of the period of this transcript and indeed was deposited in 1992 incomplete. This register is filmed on Microfilm MF1641 in the collection of the Norfolk Record Office which was used to prepare this transcript. This film is one of the more recent filmings and benefits greatly from the improvements in quality which modern techniques can bring. The images are clear and sharp and whilst the handwriting is a little tricky at times to read, overall this was a straightforward transcript to prepare.